Please note that these colors are approximate. Leather is a natural substance and as such each piece and sometimes even different areas within a piece, take up dyes slightly differently. Also, different computers display colors differently. Some of these colors can be diluted to make a lighter shade. Here is a picture of collars that are what we call block dyed. This is where we take a wooden block and wrap a cloth around it and apply the dye somewhat sparingly to the surface of the leather. This way the color does not go down into the grooves of the stamp. We can either do it over the basic leather color which is either a creamy, pinky color for veg tanned leather or a golden color for the nature tanned leather, or we can saturation dye the piece one color first and block dye a different color over top of that. Whether we use veg tanned or nature tanned depends on the colors. 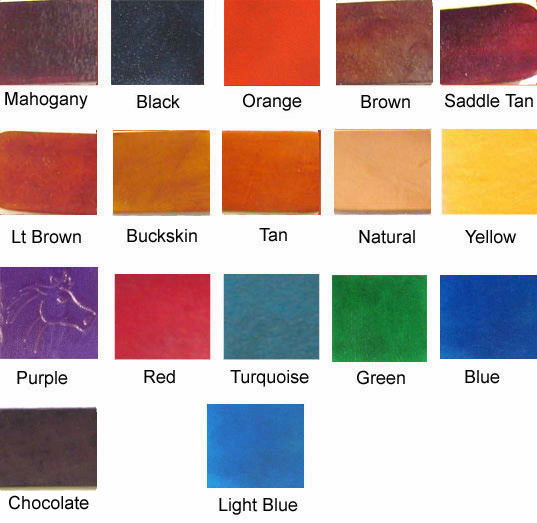 Browns can go over the golden color with no problem, but colors like blue, red, green, purple, etc go better over the lighter colored veg tanned leather. A saturation dyed collar which is where the dye is applied with a wool ball and worked down into the grooves of the pattern, is quicker so it is the base price. Block dyed over plain leather adds $5 to the price and block dyed over a saturation dyed color adds another $5 to the price. 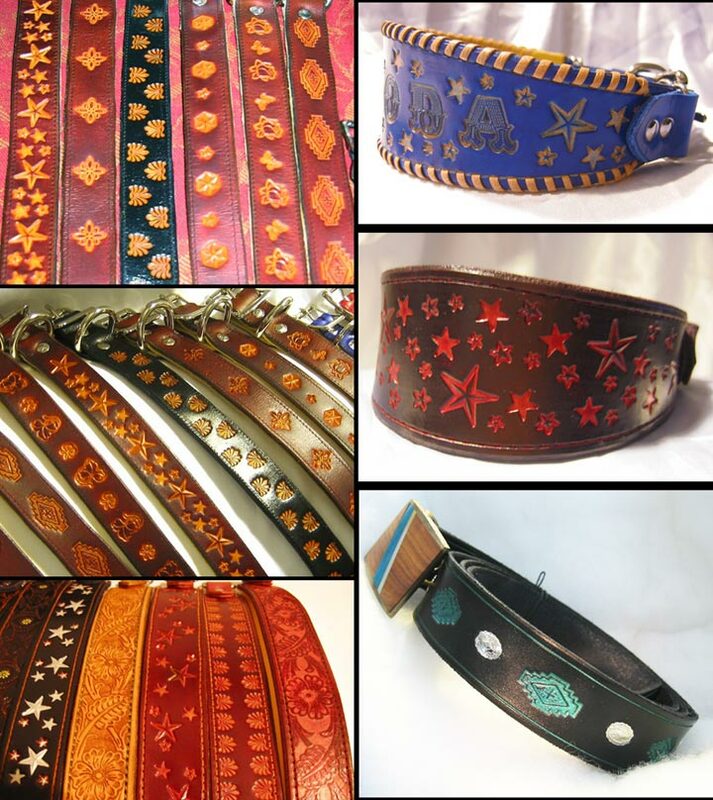 Bullhide (soft and firm) and latigo come in nice bright colors. Soft bullhide is available in red, gold, turquoise, purple, burgundy, apple green, dark green, very dark navy and black. All colors except burgundy close with a black control loop. Burgundy has a color matched control loop. Or we can use firm bullhide control loops on request. Firm bullhide is available in red, purple, olive green and burgundy. These collars close with the same color control loop. Latigo is available in red, royal blue, bright pink and jade green. These collars close with the same color control loop.